City of Bohemia. No Jews were allowed to live there until after the law of Oct. 26, 1860, which repealed the restrictions against them in Austria. The first Jewish settlers numbered about thirty families. The need of a united religious service soon became evident, and on Sept. 4, 1861, on the eve of the New-Year's feast, a synagogue was opened in a rented house; the authorities of the state and of the town were present, and the acting rabbi was I. Elbogen, district rabbi of Jung-Bunzlau. The existence of the congregation was legalized on Dec. 12, 1862, and the establishment of a cemetery was permitted two years later, the dead having been buried hitherto at Turnau, thirty kilometers distant. During the same year a special registration district was formed, with its capital at Reichenberg. A ḥebra ḳaddisha was likewise founded in 1864, which, in addition to its special duties, gave financial aid to destitute sick coreligionists, and paid for the funerals of paupers. A ladies' club was established for the same purpose, and about the same time was began the collection of funds wherewith to build at temple to accommodate the increasing community. Meanwhile the congregation, which numbered ninety families in 1869, removed from its former synagogue to larger quarters. A Talmud Torah which had been founded was later abandoned, the religious instruction being given in the public schools, while, for the protection of Jewish interests, a Jewish member was elected to the district school board. The new statutes were confirmed in 1877, although they were at first rejected by the Bohemian provincial government since they contained no mention of a ritual bath for women. The ministry, however, sustained the appeal of the community, which stated that the establishment of a separate bath for Jewish women was an antiquated institution. The fund for the temple, from which property in the center of the town had already been purchased, amounted to 44,000 florins in 1887, and the corner-stone was laid in the autumn of that year, the building being dedicated Sept. 27, 1889. The service is moderately Reform. The first rabbi, Julius Reach of Prague, officiated until 1888, when he was succeeded by Adolf Posnanski, who was followed in 1891 by the present (1905) incumbent, Emil Hoffmann. The yearly income of the community amounts to 32,990 kronen, and its expenses to 31,289 kronen. 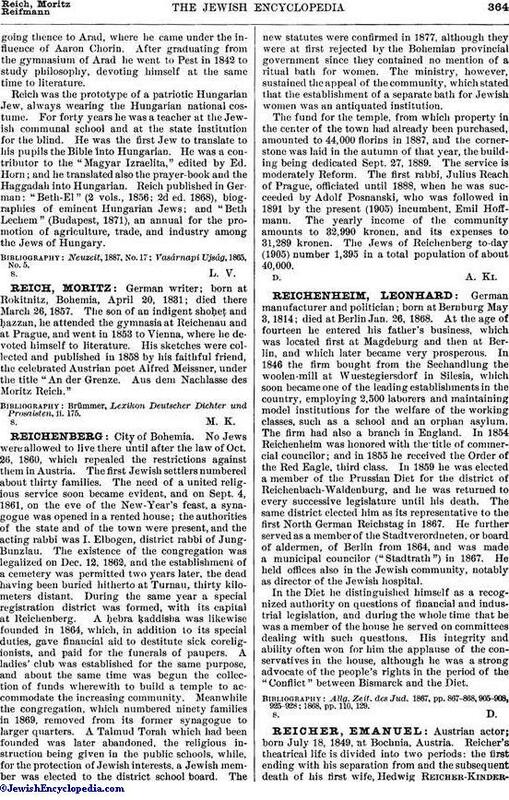 The Jews of Reichenberg to-day (1905) number 1,395 in a total population of about 40,000.